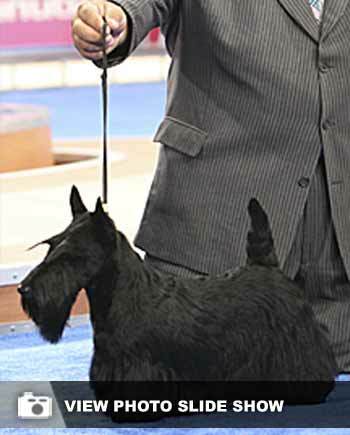 Scottish terrier Sadie wins AKC national dog show – Pet Tales : The Orange County Register. Look at that Sadie – so serious about her job and yet secretly, those Scotties can be so impish. (Okay not so secretly if you’ve had a Scottie.) I grew up with a Scottie. I love Scottie’s. Her name was Penny – she was my very first dog – we picked her out of the litter at Thanksgiving from my cousins when I was seven and I slept in the back of the car with her all the way home from Spokane to Bellevue Wa (about 5 hours). We had another dog – Rini an elderly Manchester Terrier – Penyy wasn’t a big hit with Rini but she was my dog nonetheless. I will always have a thing for Scotties. My cousin John (the same cousins) has a great Scottie named Sherman. Oh he gives my Olivia and Isabella a run for their money. He’ll pretend to play the game of letting them think it’s their house – but if there’s a ball – he’s going after it and may the best dog win. Love the name Sadie – obviously the best dog won!! p.p.s. I have blogged below about my new Cat Francesca potentially being the reincarnated Alexandria – my old cat – well I’ve often wondered if Olivia my 1/2 Border Collie is a reincarnation of Penny. Oh more random thoughts of an Animal Communicator…..another post on pet reincarnation is clearly in the future says the pet psychic!! For the full report on my students experience on the Chihuahua Festival please go to my Communication with All Life University social networking site and feel free to join if you are an Animal Communication Enthusiast: http://communicationwithalllifeu.ning.com/profiles/blogs/adventures-at-the-chihuahua It’s pretty funny. Both the students that I sent up there were in for quite a surprise. That day I was at a different event where I was around large and small dogs, rescue dogs, recue cats, great dog trainers, all sorts of wonderful pet businesses or entrepreneurs. But my students had an eye opening education that I don’t think either will forget…….The world of small dogs. It is an entirely different world. I have to gear up for that world because I’m going to South Florida here shortly. It’s a type and a landscape – I mean South Florida, Southern California – that is my bigger exposure to the world of small dogs. Perhaps New York City dogs……..the other places I’ve lived – Denver, Seattle – it’s definitely bigger dogs. So the idea that there was this Chihuahua Festival up here in the PNW with 300-400 Chihuahua’s is amazing – I feel like it’s like some Faerie Festival!! The world of small dogs vs. large dogs is a very different life than what I have with my two dogs; when I say “let’s go do chores” they race out the door to help, to smell , to do fun dog things. My dog Olivia has lived in the city, suburbs, farms and beach with me. We’ve been city chicks and we’ve been farm chicks. Yet either setting, we have expectations and training. I think the first and foremost difference between the world of large and small dogs is training. The way we train (or forget to train) small dogs is very different. People become enamored with the cuteness. The fragile….and oh it’s something I have to treat like a china doll. Meanwhile, there is nothing cute about someone biting your ankle when it gets out of hand. (Did I mention that today a rooster came after me? On the one hand that would appear harmless, I mean rooster vs. Joan – yet it drew blood. And my feelings were hurt.) The same is so with small dogs. I once went to talk to a toy poodle. That little guy was so vicious that he was dangling from my arm. Thankfully it was just a fatty spot and not a muscle tear or tendon or vein. Sometimes it’s the fear aggression that can be the worst kind because it appears to come out of nowhere. I would love to see Cesar Milan do an entire episode of Chihuahua’s. Could you just see him walking through a sea of Chihuahuas in slow motion sepia tone? Perhaps the episode would just be dedicated to perhaps the aftermath of puppy mill raid and what to do with all of these terrified little beings and give them their marching orders. Now there’s a thought. A really random thought. But cuteness aside, I bet those would be the most adoptable Chihuahua’s on the planet. I’m sitting here on my friends farm with fingers crossed that I am moving onto my new farm within the next few days. I can’t wait to get back to chores with my dogs, routines and hikes. My friend’s farm is equipped with a pug. I even have different expectations with Sophie (the pug) than I do my own. It’s been funny to watch myself and how much I expect her to stay in a down stay like I demand of my own. And part of it is she’s not my dog – what are my training expectations but the real part if I’m being honest is I don’t expect her to do the down stay because she’s a small dog…..and I know the training hasn’t gone into her like the others here because – she’s a small dog. Oh such is the life in the world of small dogs.